JHUMO RE: Iceland, So Very Different! Just last week I returned home from an unusually amazing holiday in Iceland and I must say I had a fabulous time exploring this tiny country, which completely surprised me with its dramatic landscape. I wandered in the quiet streets of Reykjavik at midnight while enjoying the sunshine, jumped and screamed like a child witnessing the playful Strokkur spout water high in the air, trekked over treacherous lava fields and steaming hills, got drenched in the refreshing spray of thunderous Gulfoss waterfall, drove past an active volcano, awed at the beauty of an azure blue crater lake, peeked in to the moss covered lava rocks looking for the hidden creatures, experienced the meditative silence of colorful mountains, and relaxed in the hot waters of blue lagoon. If I were to define the entire experience of exploring this magical land in one word, it would be incredible !! We reached Keflavik airport around 9 in the night however sunshine was at its peak, which only fades away with the frosty months of winter. As soon as I stepped out of the airport, I felt as if I had landed on some other planet with no trace of civilization. Just massive moss covered lava fields as far as eyes could see. 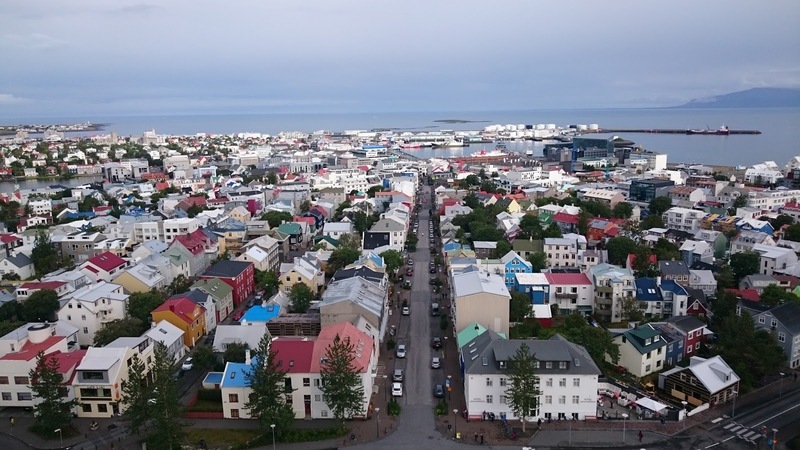 There are no local buses plying between the airport and Reykjavik so you need to either book a taxi or travel by the coaches run by tour companies, most popular ones being Grayline tours and Reykjavik excursions. The journey to Reykjavik is nothing short of intriguing. Roads appear like a thin strip of black coloured ribbon pasted to the rugged ground. Constantly looking out of the window, I was deeply observing everything, which sprouted millions of questions in my mind regarding Iceland’s unusual topography, its culture, its people and their lifestyle. Since Iceland is an extremely expensive country, we choose to book accommodation in the youth hostel, which was as good as a budget hotel. It was about 15 minutes’ walk from the bus station and was located in a quiet street in the city center. Reykjavik is a very interesting city, which sits on the seashore with its skyline dominated by snow carpeted mountains. Unlike other European cities, it has a very unconventional architecture but is extremely vibrant. The houses and buildings are clad in corrugated iron, which is painted with bright and cheerful colors. There are three prime reasons why people prefer using corrugated iron for building the houses; one, it provides high insulation; second it can easily bear and survive the wrath of harsh Icelandic climate, and third, there is a massive shortage of timber construction material as there are no forests in Iceland. Since the following day, we had an early morning trip of the Golden Circle that I had booked with Grayline tours, we choose to retire to the bed early .Due to intense sunlight that had filled the room, I could only sleep for a few hours and got ready at 6 o clock. We had breakfast at the youth hostel, which was very reasonably priced. Our tour bus came to pick us up right on time and within half an hour, we had driven away from the civilization. Golden Circle is a very popular tourist route that covers the most stunning natural attractions in Iceland from spouting geyser to gurgling waterfalls. We drove along the beautiful Lake Thingvallavatn whose waters are crystal clear so much so that you can clearly see the colorful pebbles lying in its bed. Then came our first stop; a scenic point that overlooked the high temperature Geo thermal area of Nesjavellir where sits one of the biggest Geo thermal plants of Iceland. Thick steam from the ground moving up and merging in to the clouds looked magical. From there, we headed off to Thingvellir, where the Icelandic parliament Althingi was founded in 930 AD. It is believed to be the oldest functioning parliament in the world. In the commonwealth Era, Icelanders would gather here for two weeks in June to participate in the assembly, discuss serious issues and sell their goods and services. Not only is Thingvellir known for the oldest parliament but also believed to be the place where the slowly diverging American and Eurasian tectonic plates meet. But it is not completely true as the plate boundary lies on the Reykjavik peninsula where Keflavik airport is located. As we walked past the spot where parliament sessions used to happen, we came across a small and shallow pool referred as the “Drowning Pool”. It was the place where convicts were executed. While men were hanged, women were drowned in the swirling waters of the pool by tying huge boulders to their body. Creepy!!! Our next stop was the spectacular Gulfoss waterfall, which is one of the most beautiful waterfalls I have seen so far. We quickly gorged on a Veg Panini and a heavenly chocolate & Banana cake at the Gulfoss visitor center and headed off to the waterfall. The roaring sound of the water infused me with excitement as I walked as quickly as possible to witness the gallons of water cascading down from 105 feet height into the deep canyon. There is narrow winding path that took us almost in the middle of the waterfall from where we could see the water plunging down a staircase of three steps, before abruptly vanishing in the earth. The immense spray of the waterfall left me completely drenched and brought a huge smile on my face. It was a breath-taking sight! Gulfoss is made by the river Hvita, which originates in the glacial lake Langjokull. Gulfoss means Golden falls and it is so called because the glacial sediments in the water turn the falls golden in the sunlight. There is a legend that one Icelandic woman fought relentlessly to save Gulfoss from becoming a Hydroelectric station by threatening to throw herself into the falls. A stone stands at Gulfoss as a memorial to that woman who saved it. Just close to the waterfall was the famous Geysir area, where we headed to next. It is known for its erupting hot water springs. Our tour guide clearly warned us not to touch water as it is extremely hot. Thick clouds of steam emerging from ground made this place look so mystical. Geysir is the jet like hot water eruption after which all other geysers round the world are named. However, the Great Geysir who once shot 70 to 80 meter high does not erupt anymore as in the year 1950, tourists accidentally blocked Geysir by throwing rocks in to it to set if off. Now it only comes back to life when a powerful earthquake activity shakes the area. But we were not disappointed as we got to see Strokkur in action which erupts frequently. People had gathered around with their cameras ready to shoot the Strokkur spitting out scorching hot water high up in the air but it is very hard to capture it as you never know which minute it will explode and which direction water would fall back down. Abhishek and I were really lucky to experience it erupt thrice within 5 minutes. It absolutely was an extraordinary experience. We explored the whole area, which boats around 30 small Geysir bubbling excitedly however none of them erupts like Strokkur. Our last stop on the Golden Circle tour was the Nesjavellir, which is the second largest thermal power station in Iceland. It has a very swanky building, which is surrounded by volcanic fields, snow clad hills, and thermal pools emanating thick clouds of cottony steam. Since we had booked a guided tour of the plant, we were greeted by one of the employees who walked us through the plant, showed us an interesting presentation on how it functions, and shared some really amusing facts about the plant and thermal energy. There was an amazing exhibition on in the premises which featured photographs by leading photographers capturing nature in its violent form. We quickly glanced through them and with it came an end to our fantastic Golden Circle tour, which gave us a wonderful insight in to the magical and miraculous beauty of the warm and welcoming Iceland.